Make sure you take along a notebook and pen when you visit the Adams National Historic Site in Quincy, Mass., so that you can record impressions of one of the nation's most influential founding families. Located just eight miles south of Boston, this site commemorates the public careers and literary contributions of John Adams, the second president of the United States, and four generations of his family, including John Quincy Adams, the country's sixth president. It is the onlyplace in the nation where the story of two presidents can be told from their birth to their final resting place. John Adams and his family were living in the second house when he drafted the Massachusetts Constitution, the forerunner of the U.S. Constitution, and this is where Abigail wrote many of her famous letters during the Revolutionary War, reminding her husband to "remember the ladies". Make the family's mansion with its beautiful gardens your next stop. Known as the "Old House," John Adams bought this dwelling from the Vassal-Borland family in 1787 and moved in shortly afterward with his family. The Old House was home to four generations of the Adams family: two presidents, statesmen, authors, and scholars. 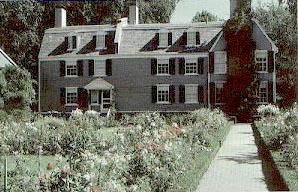 It remained in the family until 1946, when the Adams Memorial Society donated the house, along with its contents and grounds, to the federal government. The Old House holds a vast collection of decorative arts, objects, furnishings, and memorabilia acquired over nearly 150 years by different family members at various times. Adjacent to the Old House is the Stone Library, which was constructed in 1870 by Charles Francis Adams, John and Abigail's grandson. Considered this country's first presidential library, today the beautiful building houses 14,000 volumes accumulated by several generations of the family. And before you depart, stop at the United First Parish Church, where two United States presidents and first ladies are entombed. The park is open daily from April 19 to November 10. For information on trolley tours and special opportunities, call the National Park Visitor Center at (617) 770-1175.